Timmy Abell is a nationally recognized children’s recording and touring artist who has spent 30 years presenting concerts of music and storytelling for young people and families. He is a recipient of the North Carolina Arts Council’s Fellowship for Songwriting and has received the highest national awards for his recordings, including Parent’s Choice and NAPPA Gold and The American Library Association’s Notable Children’s Recording Awards. 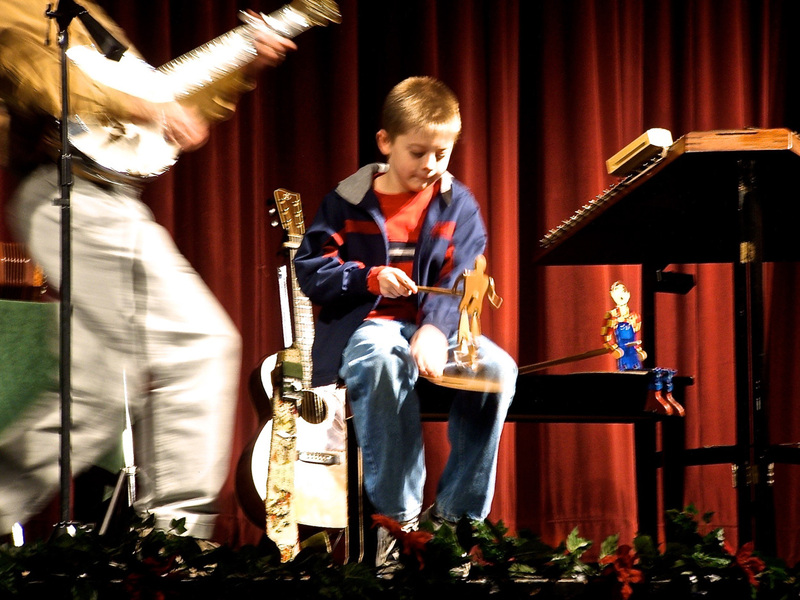 Timmy’s concerts feature music played on seven instruments (including hammered dulcimer, English concertina, guitar, banjo, bowed psaltery and penny whistle) and a repertoire of both traditional and original songs, instrumental compositions and stories. Timmy’s concerts have been presented by The Kennedy Center, The National Theater, The JFK Library, The Peace Center, Picolo Spoleto, Merlefest and in countless concert halls, theaters and schools in more than 20 states. A native of Asheville NC, Timmy has resonated with the roots of the Appalachian traditions since he was a boy. His banjo playing was deeply influenced by Clarence Ashley’s early 1960’s recordings of old-time music with Doc Watson. In addition to his sometimes bright, sometimes mellow clawhammer banjo style (his banjo lullabies will put you to sleep), Timmy also plays guitar, hammered dulcimer and English concertina. "I always wanted to share that feeling that I had as a kid, listening to Woody Guthrie or Pete Seeger, being carried off by the songs into that great big world out there. I'm pretty sure that kids don't listen to music to be told what to do or how to act any more than we do. We listen to hear the good story, and we wonder what it would be like if that story was our own. Everybody deserves real music, and I hope that we are moving in that direction." True to that conviction, Timmy’s 6th CD "Could Come True" features some of the finest musician's that the region has to offer including local treasures and Eliot Wadopian, River Guerguerian, David Holt and Josh Goforth, as well as the remarkable Nashville session players Aubrey Hanie on fiddle and mandolin and David Huntsinger on piano and keyboard. Abell’s long-time friend and Grammy-Winning producer Steven Heller has once again demonstrated his skill and years of experience in the complex and multi-layered production of this music. “Could Come True” celebrates the traditions of folk music while elevating the genre of children's music. The songs offer up a cornucopia of characters that invite listeners to imagine…a daring performing flea, a drifter who makes friends wherever he goes, a daydreaming girl who wishes her way into reality. While this new recording is rich with Timmy’s curiously inventive original lyrics, he has never let go of his dedication to the classic folk catalog. There is at least one traditional song on each of his recordings helping to preserve tunes like “The Blue Tail Fly” or “Turkey in the Straw” for future generations. “Could Come True” offers up a lively version of “Froggy Went A-Courtin”, originally about the queen of England, it’s believed to be over 400 hundred years old! The only moment of the album that could be deemed at all ‘instructional’ is an absolutely wonderful example of what Timmy does so well. As with all of his recordings, he ends with a lullaby. In this case, a strikingly beautiful and gentle suggestion to let go of the things that do not serve us well, and to hold fast to that which brings us joy. It is well worth a listen… truly words to live by, for everyone, to drift off to sleep by, no matter how old, or how young. 35 years of touring creates a legacy that spans generations, illuminating family memories, soothing the hurt and celebrating the joy. From lullabies to road songs, Timmy's music has been a touchstone for families across the mountains and beyond, offering engaging lyrics that never preach or talk down to young folks. Radio One-Sheet "Could Come True"
"Timmy Abell is an award-winning songwriter, touring and recording artist who has been delighting audiences around the country for 35 years with his roots-flavored family music - guaranteed to never talk down to your kids. Check out his new album, called "Could Come True" at couldcometrue.com and check his schedule at timmyabellmusic.com"